I took this craving and ran with it. I whipped up the dough when I got home, used leftover Awesome Sauce as the pizza sauce (delicious but not perfect as it was a little wet as I’d feared) and raided the fridge for various toppings. This was the happy result. – Place the flour in a large mixing bowl. – Add the yeast on one side and the salt on the other. Mix each into the flour a little bit then mix the flour to thoroughly distribute each ingredient. – Make a well in the centre then add the olive oil and almost all the water. Keep back a few tbsp of water and only add if you need it. – Mix the ingredients together to form a soft dough and knead. Either use a stand mixer or a hand mixer with dough hooks for about 5 minutes or do it by hand and knead for about 20 until the dough is soft and springy. – Grease a bowl with a little oil and lighlty oil your ball of dough too. – Leave to rise covered with a towel in a warm place for at least 1 hour, until doubled in size. – Heat your oven as high as it will go. At least Gast Mark 7/210C. If you have a pizza stone heat that, if not place baking trays in the oven to preheat. – Knock down the dough and divide into two. – Leave to sit for 5 minutes or so. – Roll out the dough on a sheet of baking paper until about 9″ in diameter. – Slice your cheddar into thin strips, about 1cm wide and tall and about 3-4cm long. – Place the strips of cheddar about 1cm away from the edge of your pizza. 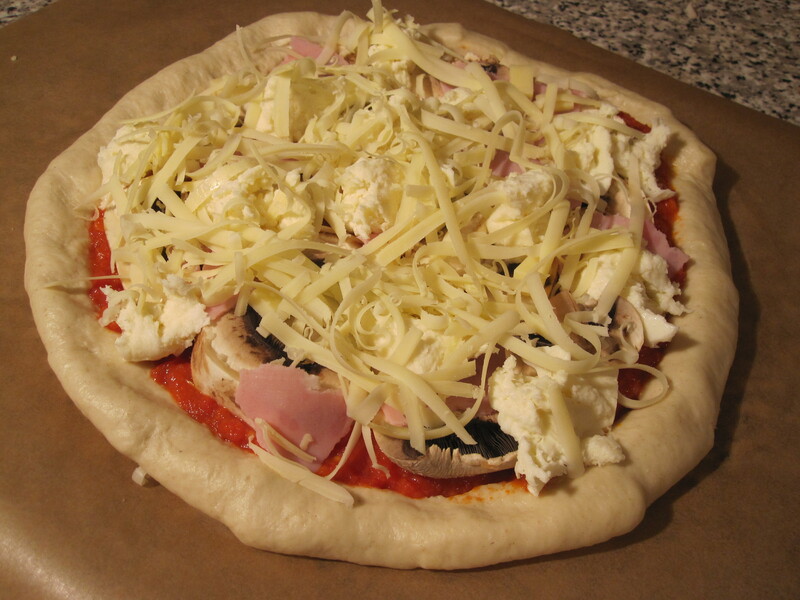 – Carefully fold the dough over the cheddar and tuck slightly under to totally enclose the cheese. Pinch the dough together to seal. – If you want a deeper crust pizza you can leave the dough to rise again for about 20 minutes before adding the sauce and toppings, if you’re hungry and impatient then you can add the sauce and toppings now. – Once you have constructed your pizza to your liking use a splatter guard/chopping board/plate/something to lift your pizza up on its baking paper and slide it onto the preheated surface in the oven. 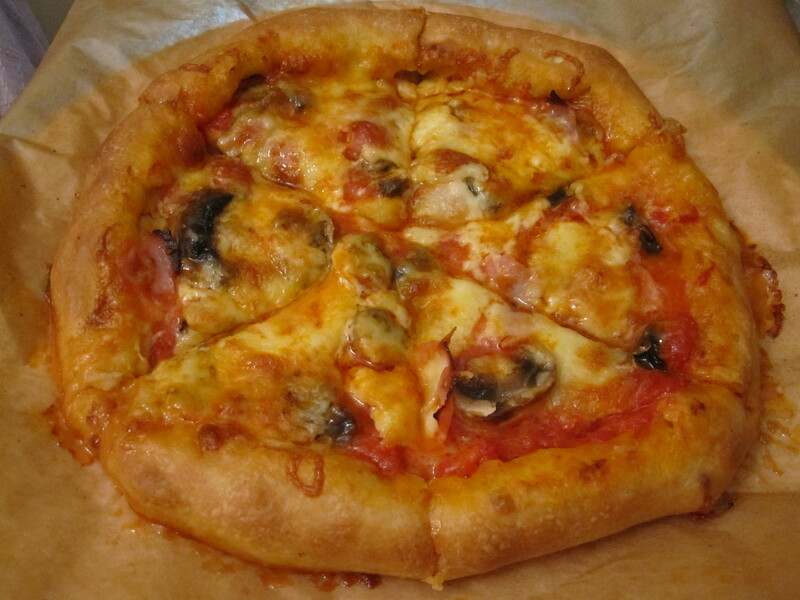 – Cook for 20 minutes or so until the crust is a golden brown and the cheese is all melty. – Leave it to cool for at least 5 minutes before slicing and eating. Nobody likes that burnt roof of the mouth you get from eating hot pizza!